Tribe7’s Robert Little: Mad scientist or visionary? Welcome to an outside the box interview! Well, actually we’re stepping outside the box and kicking it aside! I had a chance to sit down with the founder and head of Tribe 7 Lacrosse, Rob Littell. Thanks to Rob for taking the time to speak with me. You played in the North/South All Star Game and at Brown for Dom Starsia. Pretty safe to say you love lacrosse? Lacrosse is so much more than a game! It’s a family in many ways. I am lucky to be a part of this, and yup, I love our game dearly. Your stick handling skills on YouTube are dazzling. How did Coach Starsia react to that when you played for him? Did he encourage or discourage it? My skills are significantly enhanced by our pockets! Dom is a mad stickler for basic fundamentals. He once told me: “Master the fundamentals first, show me that you can ‘hit the spot’ 100 times in row, with both hands. Dazzle me with consistency.” The nice part being that if you can do that, you are well on your way to mastering off-hand behind the back shots from a yard behind the goal line. A goal is a goal when it’s all said and done, and Dom loves goals. What drew you to the game and when did you realize this was for you? I’d watched some friends play on my middle school’s 7th grade team, and one of them gave me his spare stick at the end of the season, to shut me up if I remember correctly. I played wall ball on a barn that summer till I could throw and catch with some ease. The barn wall lacked solidity, though, so most of the time the ball just dropped into the grass 15 yards away, which was annoying, but probably advanced my ground ball skills. I got to play on the 8th grade team, and it was magic! Nothing made me happier than playing lacrosse, on a team with friends. Practice, games, just carrying a stick around, whatever, I was hooked. And scoring goals? That was like going to Disney World. How did you come up with Tribe 7? Why equipment and not coaching? Tribe7 refers to the entire lacrosse community. It’s a tribute to the game’s past, and a salute to its future. In 1720, the Native American lax ballers, known as the Five Nations, added the Tuscarora out of North Carolina, becoming the Six Nations. Tribe6, if you will. In 2008, we added the rest of the lax playing world, full inclusion, making the tribe universal. All of us. Tribe7. I coached in New York City for six years, and loved it. One of our players came up to a fellow coach and I in 2008 and showed us his new stick. Coach Coughlan asked how much it was and the lad said, “$300.00.” Tribe7 was born right then and there, as Coach Coughlan and I wondered….”Lacrosse is like polo now?” And asking ourselves, “How is that growing the game?” I then had a mission. Lower the bar of entry to the game, with lower prices, and better the game, with better equipment. Because lacrosse isn’t polo, and fair is fair. We really enjoy our mission, providing the best equipment in the game, at the fairest prices. We like to say that “Tribe7 is You”, and then go about proving that we mean it. “Riding the 85” refers to tapping the 85% of our brainpower that many experts, Albert Einstein included, pointed out we do not use. It’s about accessing the ‘zone,’ accessing our internal and brilliant instinct, and translating that access into maximum performance. It’s about high performance living, starting on the field and looping into everything you do. Greg Gurenlian and I have written a short book on this subject, titled “The Art of Beasting,” which should be fun. Who are your influences? Are there any that are not coaches? Coaches have played a huge part in my life. Their mentoring, support, and yes, even discipline are a big part of all athlete’s lives. I sure appreciate it, equipment managers and trainers too! Your stick designs are so different from the other big names in lacrosse equipment. They appear to be based on this strange thing called science. Can you explain some of the principles that go into head design as well as shafts, gloves and pads? We’re big on providing innovative solutions to any size problem. The first thing we do is make a list of why something isn’t perfect. The items on that list are the problems. Then we go about coming up with solutions. We try to look at things from a different angle, starting at tabula rasa, as if we are newbies, and asking what the heck a thing is supposed to be doing. And then we figure out the best way to do as much, regardless of whatever convention is prevalent, using all available materials and technologies. We like to use a process called technology transfer, which uses proven technology from one industry and repurposing it to another. As Bill Gates said, “sometimes innovation is simple. Technology from one field is applied to another.” We used tech from a tennis ball picker-upper on the Savage7, to enhance ground balls. MFL Mesh is derived from deep water arctic trawler fishing, where it is used in three mile long nets, because it is waterproof, does not stretch and is 15 times stronger than steel. The Beast7 has runners on the scoop, to improve turf interaction, a tech borrowed from a golf club that was designed to cut through grass easily. It’s fun stuff, the creative process, brute-force thinking, like going to the cage in full BeastMode, but with your brain. I had the opportunity to use a Savage 7 and it took a little getting used to because it picked up ground balls so easily and I couldn’t break it. A complete D stick with an alloy shaft for $110? How is that possible? Beast Bundles which are 3 heads for $149.49? You realize this could turn the industry on its side if you continue providing quality equipment at reasonable prices? That’s part of our mission! We price our gear based on the principle of fairness among friends. I have been in the lax community for over 40 years now. It is family. And we, Greg, Guytaul, Billy and the whole Tribe7 team wake up hungry every day to serve our community. We have rationalized the supply chain in the player’s favour, with enough profit margin to drive further growth and innovation. Growth meaning that we save more moms a lot of money, and innovation meaning that we generate competitive advantages to help players get better faster. Alas, one of our objectives is to get their prices down. Lowering the bar to entry, helping to grow the game. 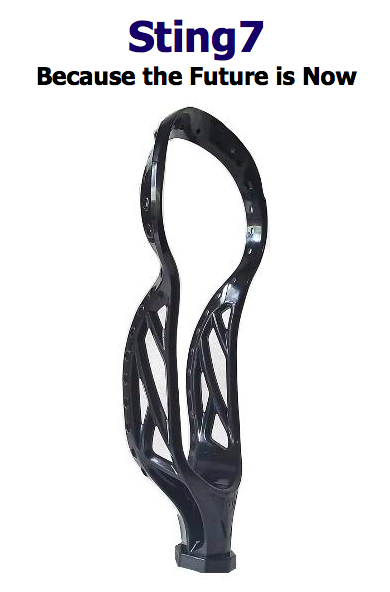 When can we see MLL players using Tribe 7 gear on the field? It’s there, but you need x-ray vision to see through the tape. What do you feel prevents other companies from following Tribe 7’s approach? I can’t speak for other companies, but we started with the objective of keeping prices low, while providing the best gear available. Our business model has evolved to ‘direct to consumer’ as it allows us to control prices best. We love to say that “we pay no man to carry our gear.” And yet top players use our gear. It’s priced really low, which aren’t great optics, but it’s the best gear. That we know. Who is more outside the box, you or Greg? What are Tribe 7 meetings like? Greg is fearless, so creativity come easy for him. We try to push the envelope, and are a better team than we are individuals. Meetings are high energy, lots of muscle in the room, both physically and mentally. Sometimes we hold meetings at Brothers BBQ on 31st and Lex, and those tend to be of the less productive variety. How does one become a member of the Tribe? All lacrosse players of part of Tribe7. We like to think of ourselves as the equipment managers for our game. It would be great if every player out there used our stuff, sure, so we’ll keep cranking out competitively advantaged gear and hope for the best. When all is said and done isn’t it all about the game? Yup. That is the prize that we must all keep our eyes on. There are a ton of distractions, of course, but we use a question to keep Tribe7 on the straight and true. We always ask ourselves, regarding everything we do: “how does it benefit the player?” So far, so good. Now you get to ask me a question! What do you think is going to take our game to the next level of participation and fan appreciation, as represented by the MLL being on par with the other major sports in the USA? Will it be a super player like a Lebron James, or after Alabama University wins an NCAA title? Or….? I feel that as a sport the “old boys club” needs to take a step back and consider the growth of the game. Yes, we are all are caretakers of lacrosse, but the shot clock has been delayed too long. Make the sport faster paced and actually compare data from MLL versus NCAA games. If lacrosse stalwarts like Quint Kessenich and Mark Millon are calling for a shot clock in the men’s game we should all take notice. Get the scissors! Stop early recruiting and commitments. Continued growth in non-traditional areas needs to continue. Denver and Notre Dame are fixtures in the NCAA tournament and Denver is now the western most school to win the D1 championship. We need to continue making players and fans on every level. As a former Auburn Tiger I hope the first team to win a championship will be wearing orange and blue! Expansion is great for the MLL, but at some point player compensation needs to be addressed and upgraded. The superstars are there, they need more marketing. The players make the league and are putting out a fantastic package with only one practice and a walk through. Imagine if they had the ability to practice more: the results would boggle the mind (or maybe just the 15%)! Competition is great even for the equipment suppliers. Keep it up and cut the red tape. Where are those scissors?